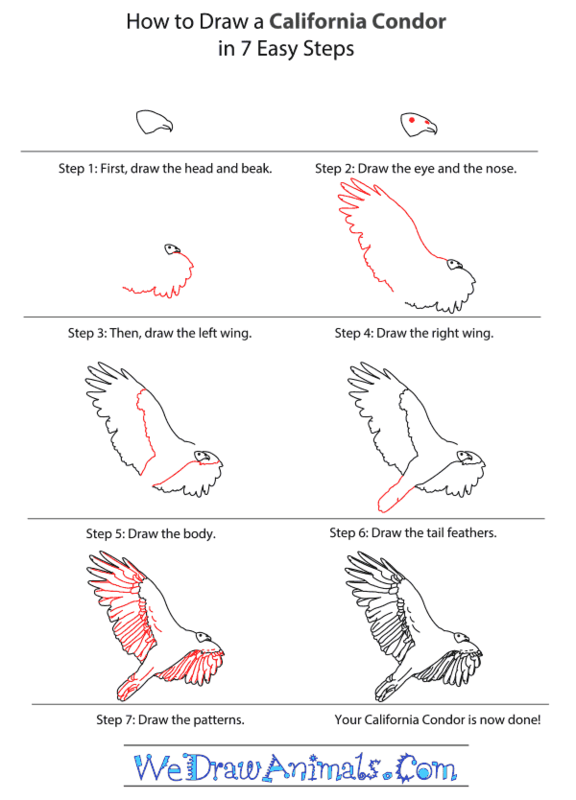 In this quick tutorial you'll learn how to draw a California Condor in 7 easy steps - great for kids and novice artists. At the bottom you can read some interesting facts about the California Condor. Step 1: The first step in drawing your California Condor is to draw its head. 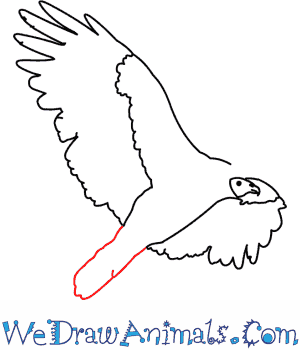 To draw the head, draw two curved lines that come together at a point to for the beak. Then draw a straight line to connect the two lines and form the back of the head. 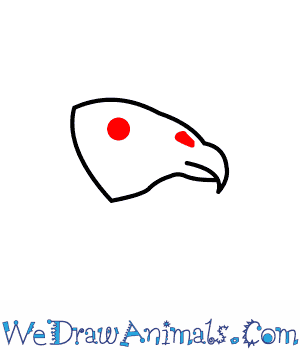 Step 2: Next draw the eye and the nose by drawing two dots, one at the beak area and one in the middle of the head. Step 3: The next step is to draw the left wing. To do this, draw a curved jagged line coming out from the head. 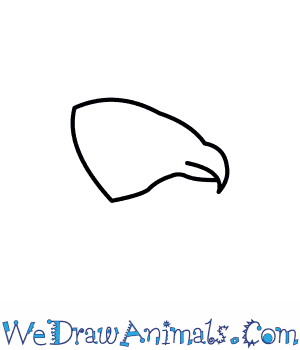 Step 4: Now you will need to draw the left wing. To start draw a angled line extending upward from the head. 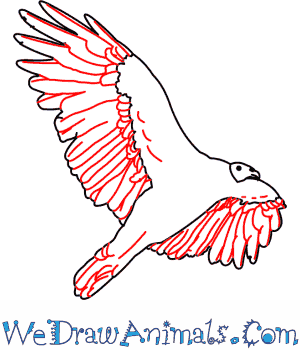 Then draw the feather pattern on the top and sides as shown above. 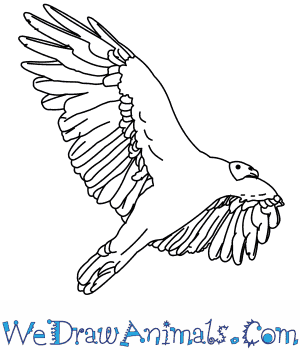 Step 5: Next will need to draw the condor's body. To draw the body, draw a straight line from the head to the bottom of the wing, Then draw an angled line across the other wing to separate it from the body. 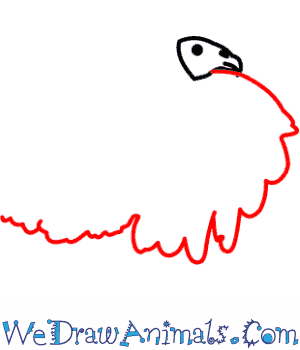 Step 6: Now you will want to draw the tail feathers. Draw a semi circle coming out from the bottom of the body using a jagged line to look like feathers. 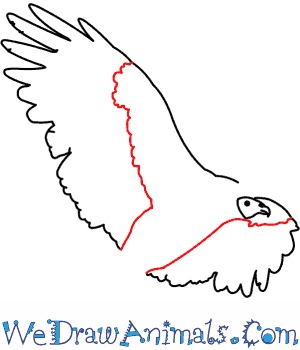 Step 7: The final step in drawing your condor is to draw the feather pattern on the wings and tail. Using straight lines, curved lines, and small semi circles, create the pattern show above. 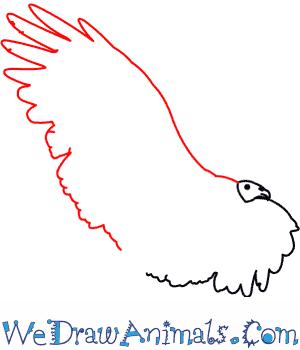 You have now successfully drawn your California Condor. California Condors are the scavengers of the southwest and west coastal forests. They can be found in rocky scrubland, evergreen forests and oak spotted grasslands. They nest high up to look for prey. The California Condor eats the dead meat left in nature. After a predator eats its fill of a kill, then the Condors and bugs get their turn. California Condors are not pretty birds. They are bald, with black glossy feathers and white patches. This ugly bald head helps the animal while it eats. The Condor will land and put its head inside of the carcass to get to the meat. A California Condor can live up to 60 years! They mate for life. Each Condor couple will mate for 6-8 years and raise one chick per year. In 1987 the last wild California Condor was placed in captivity. In recent years though the animals have been reintroduced to California, Arizona, and Mexico. They are still considered critically endangered. California Condors use their bald heads to communicate. The skin on their head will change color to tell the others how they feel! Like a vulture, a California Condor will keep cool by “urohydrosis.” Urohydrosis is when the bird pees on its legs to change its body temperature. Lesson Plan Note: There are several Native American legends about the California Condor. Look at the folklore of the Wiyot, Mono, Yokut, and Chumash tribes. Tell or share the stories with the class, then have a discussion afterwards. Young children can illustrate their favorite parts of the story. Teens and tweens can write essays about the similarities of the stories and which one was their personal favorite.